“Everything is perfect, always,” said no one. Ever. We know life isn’t perfect. No one is perfect. It’s ok to embrace those imperfections because happiness isn’t found in perfection. It’s found in moments of wonder. With the right perspective, you can see almost any moment as a wonderful moment. 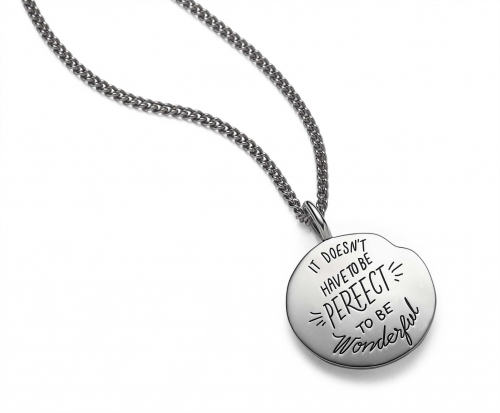 The slight dip in edge of this engraved sterling silver necklace and the irregular sizing of words reminds us that there is beauty in imperfection. The engraved quote is often attributed to Annette Funicello, The Mickey Mouse Club star who suffered with MS for decades. Despite her many health challenges, she saw beauty in life’s little moments. Pick up this necklace for the person in your life who sees the beauty in everything or who needs a little reminder that the sun still shines behind the clouds.